Note: A user account is required to use a web database. Anonymous access is not supported. This article provides an overview of Access web database design. The See Also section contains links to articles that provide an introduction to desktop database design. Note: If this information doesn’t match what you’re seeing, you may be using Office 365 after the service upgrade. Try Edit or publish a web database on SharePoint 2010 to find the information that applies to you. 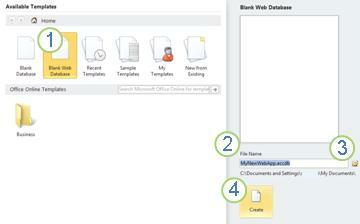 Access 2010 and Access Services provide a platform for you to create databases that you can use on a SharePoint site. You design and publish a web database by using Access 2010 and Access Services, and people who have accounts on the SharePoint site use the web database in a web browser. When you publish a web database, Access Services creates a SharePoint site that contains the database. All of the database objects and data move to SharePoint lists in that site. The following video shows the process. After you publish, SharePoint visitors can use your database, based on their permissions for the SharePoint site. Full Control This lets you make data and design changes. Contribute This lets you make data changes, but not design changes. Read This lets you read data, but you can't change anything. You can open the web database in Access, revise the design, and then sync your changes — effectively, save them to the SharePoint site. The following video shows how to make a design change after you have published your web database. You can also take your web database offline, use the offline version, and then sync data and design changes when you are back online. Note: To build a web database, you must have Full Control permissions on the SharePoint site where you want to publish it. For more information about SharePoint permissions, see the See Also section. Forms and most macros run inside the browser. This lets Access refresh data on the screen without having to redo the whole page. You can create a form to help people navigate your application. A new control, the Navigation control, makes it easy to add standard web-style navigation buttons to a form for this purpose. Note: The Navigation Pane (the feature that you use in Access to browse the objects in a database) is not available in a web browser. Although Access 2010 reports can be successfully published to Access Services on SharePoint, they won’t run in the browser when you publish them to Office 365. We recommend opening the database in Access to view reports, and using forms or datasheets to format data for printing in an Office 365 environment. All of your tables become SharePoint lists, and records become list items. This lets you use SharePoint permissions to control access to your web database, as well as take advantage of other SharePoint capabilities. All SQL processing happens on the SharePoint service. This helps improve network performance by limiting traffic to result sets. This section describes key new features and provides steps for the basic design tasks you need to complete to create a web database. There are a few tasks that you should perform before you start to design your web database. Moreover, there are design differences between web databases and desktop databases that you should know about, especially if you are an experienced Access developer. Determine the purpose of your database Have a clear plan so you can make good decisions when working out design details. Find and organize the information required You cannot use linked tables in a web database. Any data that you want to use that will not originate in the database must be imported before you publish. If you line up your data before you start designing, you can avoid having to refit your design to accommodate unexpected data challenges. Identify the SharePoint site you will use to publish You cannot publish at all without SharePoint. If you want to test your design in a browser while you design it (not a bad idea), you have to publish it first. Plan your security You can take advantage of SharePoint security to control access to your web database. Plan security early so you can build it into your design. Some database features that you can use in a desktop database are not available with Access Services. However, there are new features that support many of the same scenarios as these desktop features. The following table lists the desktop-only features, and the new feature that helps support the same scenario. Important: You can create many client objects in a web database, but you cannot use them in a browser. However, they are part of the web database and can be used in Access 2010 on the desktop. People can open the web database in Access, and then use the client objects. This is an effective way to share a database, and also opens new opportunities for working together over the Web. SharePoint handles any concurrency issues. Note: The following list is not exclusive. When you have determined what your application must do, consider whether a database template would work. Database templates are pre-built applications that you can use as-is or modify to suit your particular needs. You can review the available templates on the New tab in Backstage view. 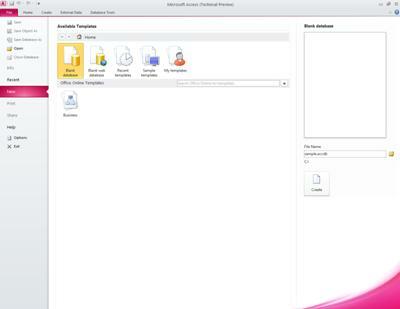 The File tab opens Backstage view, a new part of the Access interface where you'll find commands that apply to an entire database, such as Publish to SharePoint. In Backstage view, the New tab has commands for creating a database. 1. Under Available Templates, click Blank Web Database. 2. Review the proposed file name in the File Name box, and the path for the database file, listed just below. You can change the file name by typing in the File Name box. 3. To change the path, click the folder icon next to the File Name box to browse for a location to put your database file. 4. Click Create. Your new web database opens and displays a new empty table. Note: You use Datasheet view to design a web table. When you first create a blank web database, Access creates a new table and opens it in Datasheet view. You can use the commands on the Fields tab and the Table tab to add fields, indexes, validation rules, and data macros — a new feature that lets you change data based on events. After you edit and use the new table, you'll most likely want to create more tables. When you first create a table, it has one field: an AutoNumber ID field. You can add new fields to store the items of information required by the table subject. For example, you might want to add a field that stores the date you begin tracking something. You can choose from a variety of preformatted fields and add them to your table by using the field gallery. On the Fields tab, in the Add & Delete group, click the field type that you want. With the table open, click Click to Add, and then select a field type. Give the field a name that reflects its contents. Tip: To change the name of an existing field, double-click the field name. Repeat for each field that you want to create. Formatting and properties determine how a field behaves, such as what kind of data it can store. You can change these settings so that the field behaves the way that you want. Select the field that has formatting and properties that you want to change. On the ribbon, click the Fields tab. Use the commands in the Formatting and Properties groups to change the settings. You can add a field that displays a value that is calculated from other data in the same table. Data from other tables cannot be used as the source for the calculated data. Some expressions are not supported by calculated fields. With the table open, click Click to Add. Point to Calculated Field, and then click the data type that you want for the field. Use the Expression Builder to create the calculation for the field. Remember that you can only use other fields from the same table as data sources for the calculation. The See Also section contains links to articles that provide information about how to use the Expression Builder. You can use an expression to validate input for most fields. You can also use an expression to validate input for a table, which can be useful if you want to validate input for a field that does not support validation, or if you want to validate field input based on the value of other fields in the table. You can also specify the message that is displayed when a validation rule prevents input, known as a validation message. Select the field to which you want to add a validation rule. In the Field Validation group, click Validation, and then click Field Validation Rule. Use the Expression Builder to create your validation rule. In the Field Validation group, click Validation, and then click Field Validation Message. Type the message that you want to display when input data is not valid, and then click OK.
Open the table to which you want to add a validation rule. In the Field Validation group, click Validation, and then click Record Validation Rule. In the Field Validation group, click Validation, and then click Record Validation Message. To create a relationship in a web database, you use the lookup wizard to create a lookup field. The lookup field goes in the table that is on the many- side of the relationship, and points to the table that is on the one- side of the relationship. Open the table that you want on the many- side of the relationship. Click the arrow next to Click to Add, and then click Lookup & Relationship. Follow the steps of the Lookup Wizard to create the lookup field. Open the table that has the lookup field that you want to modify. On the Fields tab, in the Properties group, click Modify Lookups. Right-click the lookup field, and then click Modify Lookups. Follow the steps of the Lookup Wizard. You can implement cascade updates and deletes by using data macros. You can use commands on the Table tab to create embedded macros that modify data. The following video shows you the basics. The See Also section contains links to articles that provide more information about creating data macros. You can use a query as the data source for forms and reports. Queries run in the service, helping minimize network traffic. For example, suppose you use a web database to track charitable contributions. You want to see who donated money while an event was occurring. You could use a query to select the data and prepare it for use in forms and reports. Note: This procedure uses the charitable contributions template as an example. You can follow along if you create a new database by using the charitable contributions database template. On the Create tab, in the Queries group, click Query. In the Show Table dialog box, double-click each table that you want to include, and then click Close. In this example, double-click Constituents, Donations, Events, and EventAttendees. Create any required joins by dragging fields from one object to another in the query design window. In this example, drag the ID field from Constituents to the DonorConstituentID field in Donations, and then drag the DonorConstituentID field from Donations to the ConstituentID field in EventAttendees. Add the fields that you want to use. You can drag the fields to the grid, or you can double-click a field to add it. In this example, add Event from the table Events, DonationDate from the table Donations, and Greeting, FirstName, and LastName from the table Constituents. Add any criteria that you want to apply. In this example, you want to limit DonationDate so that it falls between the StartDate and EndDate of the event. In the query design grid, in the Criteria row under DonationDate, type >=[StartDate] And <=[EndDate]. Forms are the main way to enter and edit data in your web database, and are also useful for reviewing data. Forms run in the browser, helping optimize performance. When you open a form, your browser retrieves the required data from SharePoint. You can filter and sort the data in the form without having to retrieve data again. Tip: For best performance, limit the records retrieved by your main forms and reports. Select a table or query to use as a data source. Note: If you want to create an unbound form, skip this step. Form Create a simple form that shows one record at a time, using the object you selected as a data source. Note: If you are creating an unbound form, this button is not available. Multiple items Create a form that shows multiple records at a time, using the object you selected as a data source. Blank form Create a form that has nothing on it. Datasheet Create a form that looks and behaves like a datasheet, using the object you selected as a data source. Note: Although Access 2010 reports can be successfully published to Access Services on a SharePoint Server, they will not run in the browser when published to Office 365. We recommend opening the database in Access to view reports, and using forms or datasheets to format data for printing in an Office 365 environment. Reports are the main way to review or print data from your web database. In an Office 365 environment, you must open the database in Access before you can view a report. When you open a report, Access retrieves the required data from the SharePoint server. You can filter and sort data in the report without having to retrieve data from the server again. Report Create a basic report using the object you selected as a data source. Blank Report Create a report that has nothing on it. People need a way to navigate your application. Remember — the Navigation Pane is not available in a web browser. For people to use your database objects, you must provide them a means. You can create a Navigation form and specify that it be displayed whenever someone opens your application in a web browser. Moreover, if you don’t specify a form to display when the application starts, no form will open, making it difficult for anyone to use the application. Tip: You might want to wait until last to create your Navigation form, so that that you can add all your objects to the form when you create it. On the ribbon, click the Create tab. In the Forms group, click Navigation, and then select a navigation layout from the list. To add an item, drag it from the Navigation Pane to the Navigation control. Note: You can only add forms and reports to a Navigation control. Add any other controls that you want to the body of the Navigation form. For example, you might want to provide search functionality across all forms by adding some controls to your Navigation form. In the Access Options dialog box, click Current Database. Under Application Options, click Web Display Form, and then select the form that you want from the list. Note: You do not have to select your navigation form as the web display form. You can specify any web form. Note: You can watch a video of this process in the Overview section. On the File tab, click Save & Publish, and then click Publish to Access Services. The compatibility checker helps you make sure that your database will publish correctly. If it discovers any issues, you should address them before you publish. Note: If any issues are discovered, Access stores them in a table called Web Compatibility Issues. Each row in the table contains a link to troubleshooting information. In the Server URL box, type address of the SharePoint site where you want to publish the database. Note: For Office 365, use the sharepoint.com address (for example, http://Contoso.sharepoint.com). In the Site Name box, type a name for your web database. This name will be appended to the Server URL to produce the URL for your application. For example, if the Server URL is http://Contoso.com and the Site Name is CustomerService, the resulting URL is http://contoso.com/customerservice. Click Publish to Access Services. After you make design changes or take a database offline, you eventually want to synchronize. Synchronizing resolves differences between the database file on your computer and the SharePoint site. Open the web database in Access and make your design changes. When you are finished, click the File tab, and then click Sync All.